What’s The Best Chest Seal For Sucking Chest Wounds? The treatment of a “sucking chest wound” in the field has typically been with application of some type of occlusive dressing. Many times, a generic adhesive dressing is applied, typically the same kind used to cover IV sites. This is quick, easy, cheap, and readily available in the ambulance. But there is a danger that this could result in development of tension pneumothorax, because the dressing not only keeps air from getting in but also keeps any buildup of pneumothorax from getting out. To avoid this, a number of vented products have been developed and approved by the US Food and Drug Administration (FDA). These devices have some sort of system to allow drainage of accumulating air or blood, typically a one-way valve or drainage channels. They also need to stick well to a chest wall, which may have blood or other fluids that might disrupt the seal completely. The US Army has a strong interest in making sure the products they use for this purpose work exactly as promised. The US Army Institute of Surgical Research examined 5 currently FDA-approved products to determine their ability to adhere to bleeding chest wounds, and to drain accumulating air and/or blood from the pleural space. They developed an open chest wound with active bleeding in a swine model. 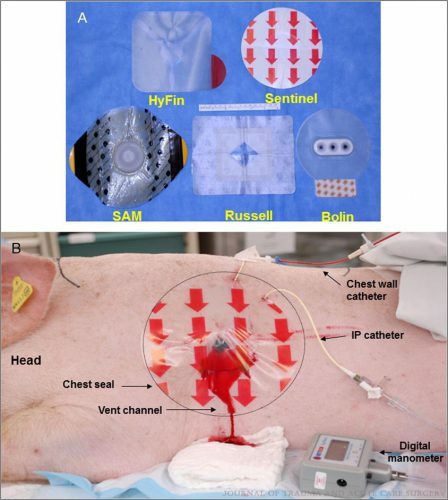 Chest seals with one way valves did not evacuate blood efficiently (Bolin and SAM). The dressings either detached due to pooled blood, or the vent system clogged from blood clot. Bottom line: Prehospital providers need to be familiar with the products they use to cover open chest wounds. Totally occlusive dressings can result in development of a tension pneumothorax if there is an ongoing air leak from the lung. Vented chest seals are preferable for these injuries. Just be aware that vented seals with drainage channels perform much better than those that rely on a one-way valve. evaluation using a swine hemopneumothorax model. J Trauma 83(1):182-189, 2017.